CAPECANAVERAL, Fla.? NASA did not violatefederal law or congressional guidance by taking actions that wouldprematurelykill the Constellation program, according to a legal opinion releasedMonday bythe government's watchdog agency. U.S.Government Accountability Office attorneys found"no evidence" that NASA was holding back Constellation funds or"taking any steps to terminate or endthe Constellation program." 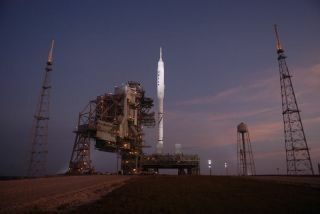 Theopinion respondedto a requestfrom members of Congress who criticized aJune 9 letter from NASA Administrator Charlie Bolden as a back-dooreffort tokill Constellation, the return-to-the-moon program that PresidentBarack Obamawants to cancel. Theletter announced a new set of priorities for thefiscal year ending Sept. 30, giving "low priority" to projects thatcould only be used by Constellation. "Wewere doing the things we needed to do to staywithin appropriations law and believe the GAO opinion supports ouractions," said Bob Jacobs, a NASA spokesman. U.S.Rep. Bill Posey, R-Rockledge, said Monday that"while NASA may have complied with the letter of the law they certainlyfailed to follow the spirit of the law." Despitecontroversy over the letter, it has not had amajor impact. Work continues on the Ares I rocket and the Orionspacecraft. PendingNASA legislation in the House and Senate wouldpreserve some key Constellation elements in a restructured humanspaceflight program. Publishedunder license from FLORIDA TODAY.Copyright? 2010FLORIDA TODAY.No portion of this material may be reproduced in any way without thewrittenconsent of FLORIDATODAY.